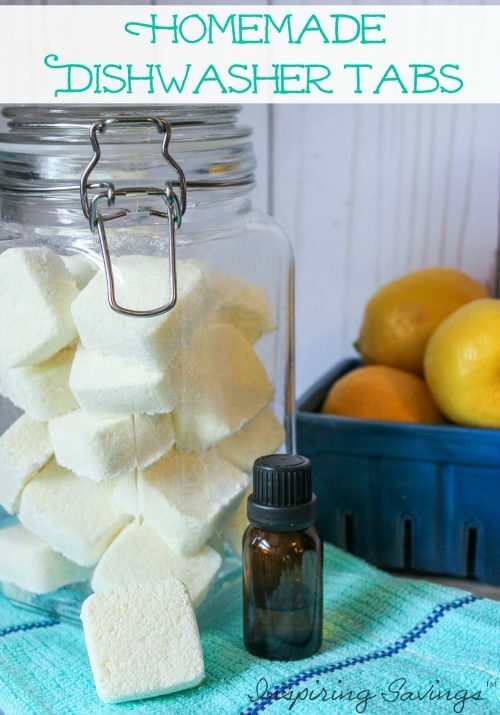 Making your own homemade dishwasher detergent is one of those all natural cleaners that is so easy to make. You will be left wondering why you didn’t start making it a long time ago! Get this recipe made with essential oils. Tired of spending lots of money on store-bought dishwasher detergents? I am! Enter any supermarket and it’s obvious that detergent is big business. Let’s stop wasting money and make your own. 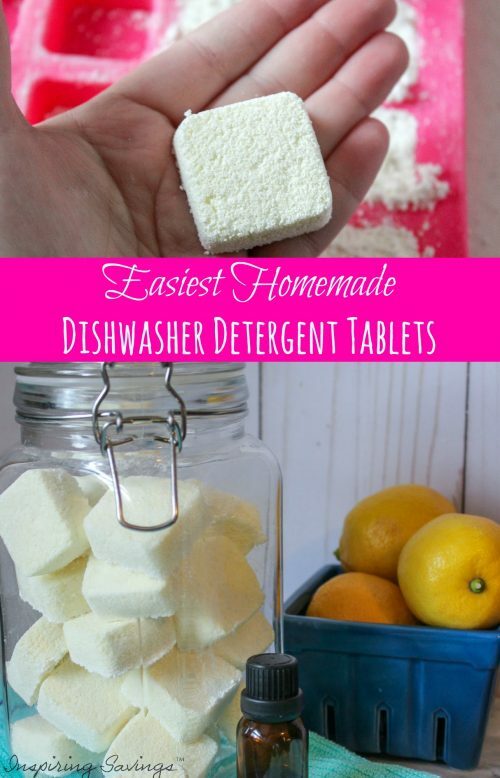 I have come up with the Easiest Homemade Dishwasher Detergent. With the price of dishwasher tablets these days, it will make you second guess your purchases. Without a good deal or a coupon, they can be really expensive. Often times, many of us are buying them without the use of coupons. YIKES! One of my biggest pet peeves is opening up my dishwasher expecting to find clean dishes and instead find caked on food on the plates. Lets not forget finding water spots on the silverware and glasses. OY VEY! Dirty dishes AFTER they’ve already been washed. Purchasing expensive in store laundry detergent is one reason why I decided, that I must to make my own. First, my frugal mind can’t wrap my head around the expense. And the other fact, is must be a natural, non-toxic dishwasher detergent alternatives we can make at home that really works? 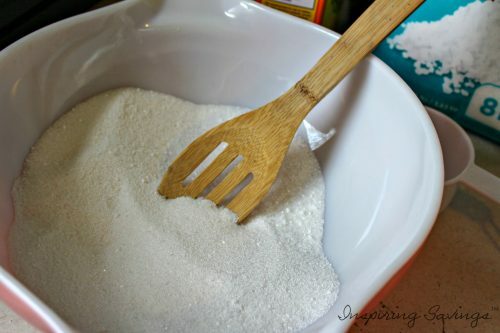 The first step is to mix borax, Epsom salts, washing soda together with a spoon. Then add 8 drops Lavender and 4 drops Lemon essential oils to the dry mixture. Next stir to mix well. Slowly add the lemon juice while stirring at the same time. You will want your mixture damp enough to mold and stick together. Keep a careful eye, not to add it all in at once. You do not want it to be a well-saturated mixture. Once all the ingredients are well combined, you will notice it actually will start clumping all by itself. Transfer the mixture into a couple of ice cube trays or your favorite silicone mold, and press down until each compartment is hard packed with detergent. This recipe makes the perfect amount to fill our mold tray! (24 squares) If you do not have a silicone mold, you can use an ice cube tray. I do find that the silicone mold is much easier use and that your homemade dishwasher detergent tabs pop right out. This DIY recipe mixture can easily be made in less than 5 minutes. Now the hardest part for me is ..… waiting! You are going to want to make sure that your dishwasher detergent tabs sit to completely dry. If you have a nice sunny spot outdoors it will speed the process along. Just let your uncovered silicone mold sit outside for at least 6 hours. If indoors, it is a safe bet to let them sit overnight at least 24 hours before removing them from your tray. When they are good and dry, remove them from the trays. You can store them in a container with a tight-fitting lid. This homemade dishwasher detergent does have a shelf life of months, but if you plan on storing it for longer, be sure you store it in a dark bottle or dark spot. The light can change the effectiveness of the essential oil. 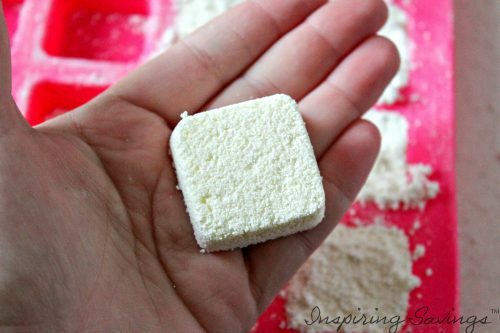 Put one of your homemade dishwasher tabs in your dishwasher as you normally would. I often add vinegar to my dishwasher where the rinse agent would go or just add a splash directly to the bottom of your dishwasher before starting. Please Note: If you have hard water; adding vinegar is crucial if you want to avoid cloudy dishes! Just made with my preteen kids, safe and easy! Love the smell, although i used 5 drops of lemon oil. I also used ice cube trays because when the silicone molds came from amazon there was only silcone on the bottom. set them out to dry in the sun! cant wait to try them out. That is so great to hear. Minus the silicone molds. Sorry, you had such problems with it. What a fun project to do with your preteen.